Desire Caught by the Tail—Have you ever heard of Pablo Picasso, the famous playwright? Yeah. Me neither. That's because almost no one knows that Picasso toyed with literature as well as visual art. His best known play, Desire Caught by the Tail, was scribed in 1942 in Paris during the Nazi occupation. Its first performance was directed by Albert Camus in a salon in front of a handful of literary stars like Jean-Paul Sartre, Simon de Beauvoir, Michel Leiris and Raymond Queneau. In the final scene of Tony Kushner’s Angels in America, an angel falls from the sky with a message for a dying man. The message is not of death, but of a path he must follow, a path to a new life. 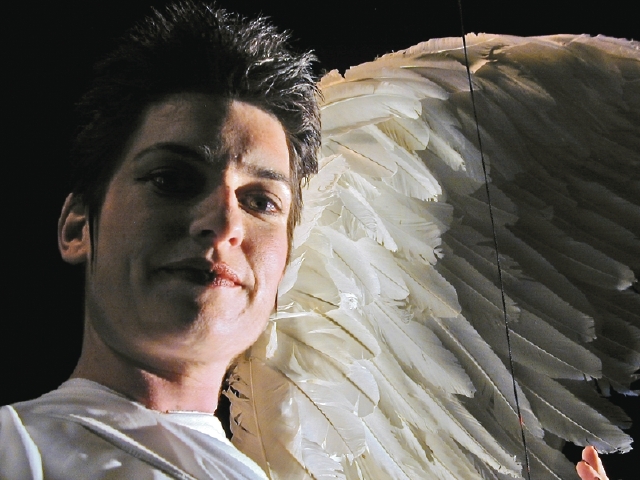 For the Albuquerque Little Theatre, the angel is the new path. Over the past year, Genevieve Russell has photographed 24 jazz musicians connected to New Mexico to create a photo series for the KUNM show “Jazz of Enchantment.” Russell, through portrait and performance photographs, has captured the essence of each musician and the music they play. Based in Santa Fe as a freelance photographer, designer and teacher, Russell has a diverse portfolio ranging from in-depth documentary photo essays to multi-layered portraits. Her prints will be on exhibit at the Inpost Artspace (210 Yale SE) through most of October. An opening reception will be held on Friday, Oct. 6, from 5 to 8 p.m., and the musicians featured in the show will have a jam session at a closing reception on Friday, Oct. 27, at 8 p.m. For details, call 268-0044 or visit www.outpostspace.org. Close your eyes and imagine seven figures with bright costumes tracing tranquil complex patterns across the dance floor with precision footwork and turns. Or forget about all that imagination hooey, and just go see the real deal when dancers from New York-based Murray Spalding/Mandalas performs dance-meditations this Saturday, Sept. 30, at N4th Theatre (4904 Fourth Street NW) at 8 p.m. The company has created an appealing fusion of mindfulness and Eastern spiritual practices with Western dance traditions set to original music by resident composer Evren Celimli. Tickets are $10 and can be acquired at the door or by calling 345-2872. For more information about the show, visit www.murrayspalding.org or www.vsartsnm.org.